Similar to the other battle royale game, the newest Apex Legends also offers a seasonal battle pass for players who want to experience the game to its extreme. Obviously, battle pass owners will receive new character cosmetics, skins, and likely to include missions that they need to finish before the season ends. While the exact details of each season are not yet announced, EA and Respawn Entertainment have revealed the highlight and new features that will come each season. So far, we only got the release date and the features for the first year of Apex Legends. 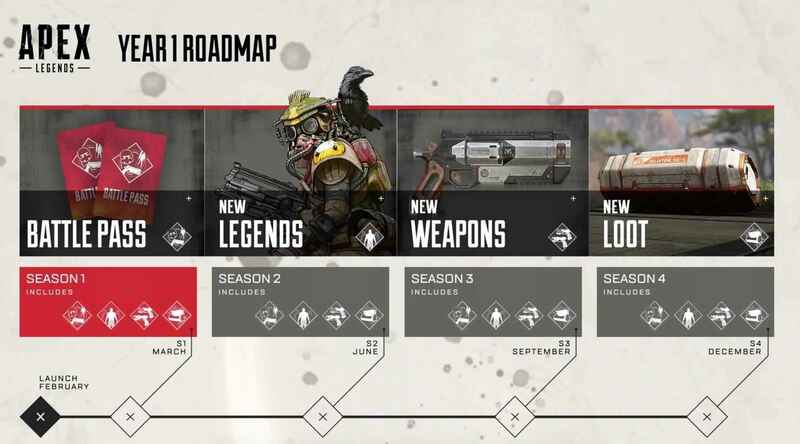 According to the official announcement, Apex Legends will have a total of 4 seasons this year. Season 1 – The first release of the Battle Pass is set to launch on March 2019. Season 2 – New Legends are about to rise on June 2019. Season 3 – New weapons will be added on September 2019. Season 4 – New loot items will be out on December 2019. As for the price of the seasonal battle pass, we still have no idea how much will it cost. But looking at the current price range of the battle pass of top battle royal games, it’s likely that Apex Legends Battle Pass will range from $9.99. Until there no official details have been revealed yet, take this price quote lightly. We will be updating this post as soon as we get new information.